Editor's Note: Jonathan Trajkovic is a Data Analyst working for Synaltic in Paris, France. In this #HackerMonth blog post, Jonathan explains how he built a viz to simulate the results of a French presidential election. Check out more of Jonathan's work on his blog, Tips and Viz with Tableau! This month, Tableau Public launched Hacker Month to promote out of the ordinary vizzes. I chose to remake an old viz I did 3 years ago about the presidential election. This viz was created during the "inter-rounds weeks", and the aim was to simulate the final result: who will be the next president?! The first part of the calculation is the percentage for the left side candidate and the second part is the total. This calculation gives me a percentage used in a bar chart. The same method was used to create the map (the difference is that I chose vote quantity instead of percentage). Moreover, I tried to create a map which shows an overview of French counties as a function of the political side. This map was different compared to ones seen in the press. 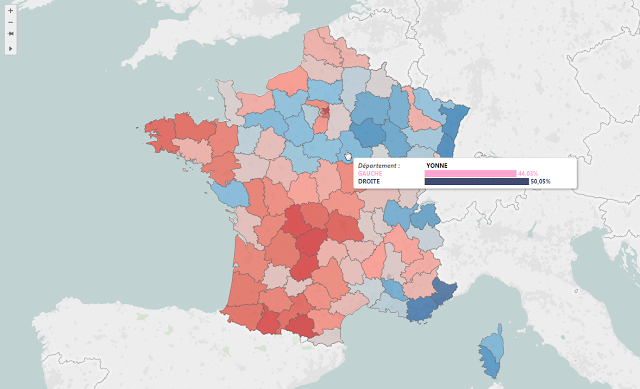 Indeed, this was not a map as a function of political party, and it tried to show a different view of French counties. For instance, it is not because a county chose UMP (right side) that the global trend is right side and vice-versa! This calculation could be set in the tooltip to create a bar. In this case, the measure is relative (percentage) and divided by 2 because I used 50 special characters (and not 100). The result is a bar chart in the tooltip that we can customize (color, font, etc...). The last trick I used 3 years ago was custom geocoding. 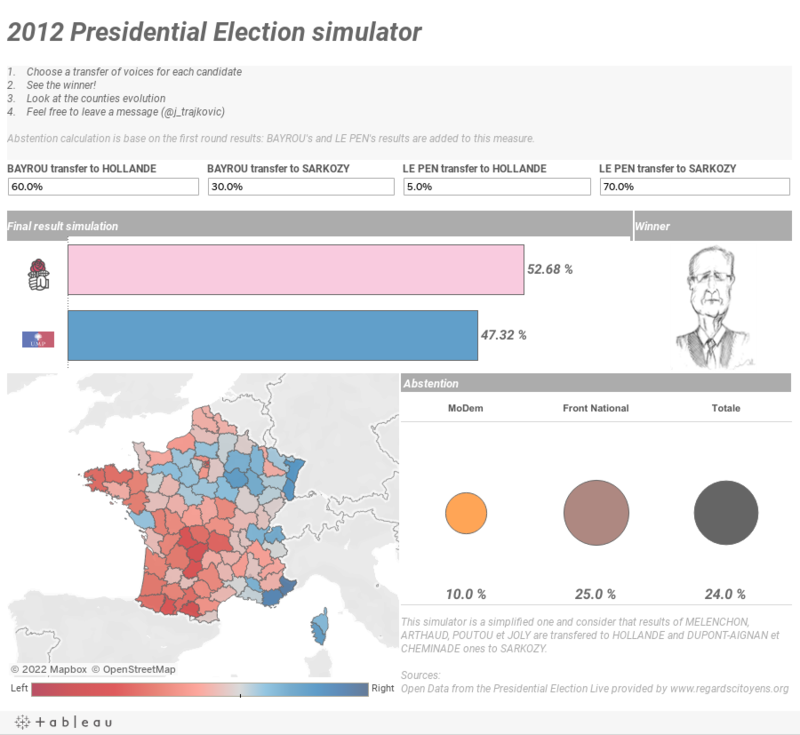 Indeed, in 2012 counties for France was not available in Tableau Desktop. That is why I created a dataset allowing me to draw counties. If I had to remake it now, I think I will build the dataset in another way to make it easier to use.